"Ashley, who's this?" a friendly voice came from behind the receptionist's desk. "I didn't know we had any more appointments today." He was a tall, athletic man with military-short, dark brown hair and caring eyes. Luna had chosen to come to his office after seeing him at the grocery store. Dr. Graham had stopped his cart to help a young mother whose toddler had destroyed a towering display of cereal boxes. She had been on the verge of tears as she tried to corral her son and restore the display. He had distracted the little boy with his deep voice as he reassured the mother and rebuilt the display. After hearing the mother thank him using his name, she'd remembered it. Luna didn't see a lot of selfless acts of kindness. When her tooth started hurting, she'd walked several miles to see if he would help her. "We don't have any more appointments today, doctor. This young lady's going to call tomorrow for an appointment," the receptionist said smoothly, and she steered Luna toward the door with a strong hand on her arm. Twisting away from her grip, Luna walked quickly to the counter. "Dr. Graham, I hate to bother you, but I've got a toothache," Luna explained gesturing to her jaw. "Wow! You sure do. I can see the swelling from here. You should have come to see me a long time ago. How long has this been hurting?" he asked kindly walking closer. This slender, young woman intrigued him. She was dressed simply but cleanly in jeans and a tee shirt. She met his light brown eyes honestly. There was something about her that raised his protective instincts. He felt like he should care about her more than just a patient in his practice. He ran his fingers gently over the swelling in her jaw to assess the problem. He could see the pulse beating at her throat quicken. "A week or so," Luna answered vaguely. It had been bothering her for longer than that, but she hadn't known what to do. "My problem is . . . I don't have any money or insurance to pay you. I was hoping that you'd let me repay you by cleaning your office or working on the gardens outside. I'm pretty good at both. I'll work for as long as you wish until I've repaid you," Luna said in a rush she tried to stand straight and look in his eyes, but she could see the receptionist's face contort in ridicule from the corner of her eye. She felt her shoulders begin to round in as she waited for the refusal. Her eyes stayed linked to his. For a few seconds, she felt as if they were communicating silently. His masculinity and strength reassured her. "Well, isn't this ridiculous! You come in off the streets at the end of a long day and ask everyone to stay late to treat you. And you don't have any money! You've got some nerve!" she berated Luna. Luna hopes she's found someone that will help her. Dr. Graham sees something in the thin redhead that makes him want to care for her. Maybe they've both found the one to fulfill their dreams. Some of the characters from the first eighteen novels in the Dr. Richards' Littles series reappear to continue their stories. You do not need to read the stories in order. The books do not necessarily take place in chronological order. All are complete stories. 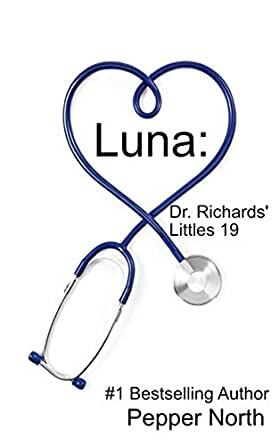 Luna's story is a lovely added addition to the Dr. Richards' series. I hope that these keep going on for books and books to come. Pepper North is by far my favorite age play author and although I love her other series, this one is my favorite. Thank you for lovely affectionate good reads. A sweet, sweet story. I really like how Ms. North writes her daddies. Luna needs dental work and for a homeless person that is difficult. When she sees Dr. Graham help someone in the grocery store she feels like he might help her. A very cute read. I have all of the Dr. RICHARD'S LITTLES books and each story is unique. This one flowed effortlessly and I couldn't believe I was at the end. Wonderful love story. Look forward to the next one. Wonderful story line, could feel for Luna about going to the Dentist, so glad Dr.Sebastian found his little girl & was able to help her.